Abstract: Chinese Wushu has a fairly long history, playing an active role in promoting physical and mental devel-opment of individuals and building a healthy personality of individuals. 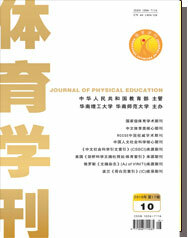 However, in the process of individual edu-cation, usually people value only the education function of Wushu on individual development, but neglect the en-joyment function of Wushu on individuals, which results in the failure of the value of Wushu education to be fully embodied. In the process of Wushu education, individual development function and enjoyment function should be combined all together, so that Wushu education can serve for culturing comprehensively developed talents.